Batwoman. I am curious. Price-wise, how does a guitar like this compare to others out there? I know that is a hard question to answer because of the wide range in quality of guitars, but any thoughts would be interesting to hear. 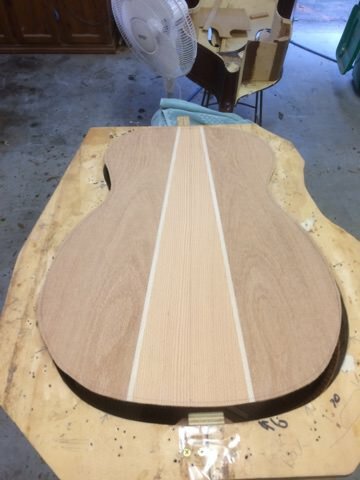 Great to see that this guitar is Queensland-made!! Right? I am a Queenslander!! Gorgeous!! You must lay awake nights in anticipation. Can’t wait to see it finished, but more anticipating hearing it. Yep you're right about lying awake fizzing with excitement Dave. Hearing me play it? Maybe. Exciting stuff. 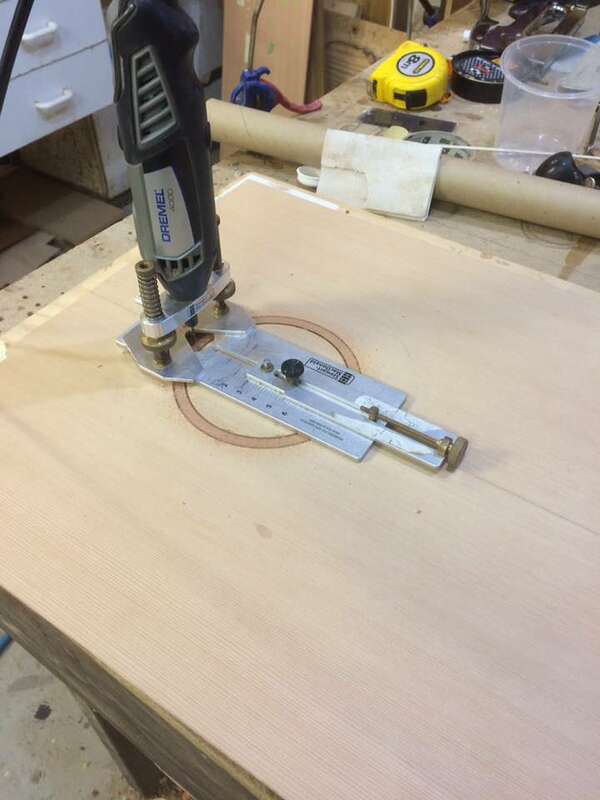 There is no substitute for quality craftsmanship. Can’t wait to see the next instalment! Pete is a superb craftsman. He takes heaps of time with every aspect of the build. 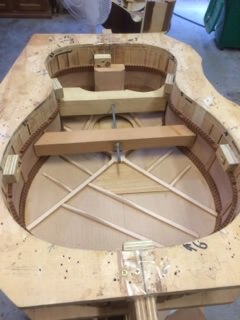 I saw one of his guitars crafted for a friend last week. It is superb. 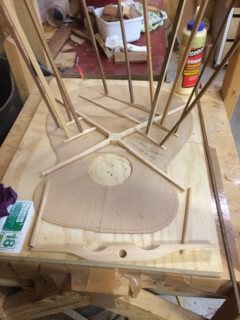 My friend wanted a parlor style guitar with the capacity to take heavy strings and a heavy hand. 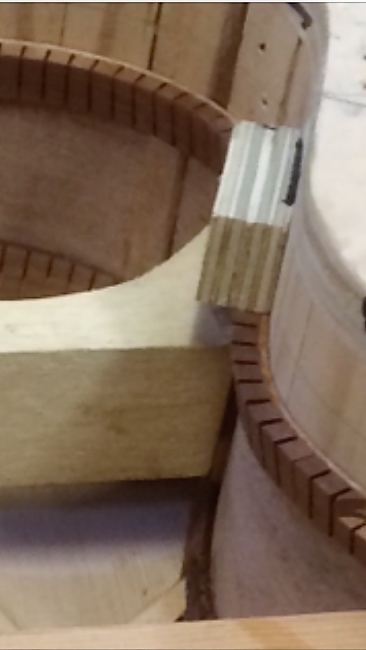 The neck has been done with as much skill and care as a very expensive tailor-made suit. I'm glad you're enjoying it Sweed. I sure get a buzz out of posting the photos and having folk like you to share it with. Yes BCDC it's a hard question to answer, there are so many variables. I wanted a Maton, couldn't find what I wanted, even when I when over my price point. I searched for ages, trying out all the big brands - Gibson, Taylor etc, none of them flicked my switch. The first time I heard one of Pete's studio models I broke out in goosebumps. All I can say is that for the same amount of money I was prepared to pay for a ready made guitar, I'm getting this superb instrument, made to suit my hands, my style of playing, the sound I want etc. It's also important to me that the guitar is made from non-endangered timbers (part of my guitar is made from an old door) and that it hasn't come from a sweat shop. Pete has been very generous with discounts as I belong to a local Acoustic Club. This will be my only guitar and it's a once in a lifetime thing for me. Every cent I'll pay is worth it. Thanks Batwoman. I think you answered the question as well as anyone could. I like the idea that this is QLD made from Aussie wood.....especially recycled wood. Can’t wait to see the finished product. 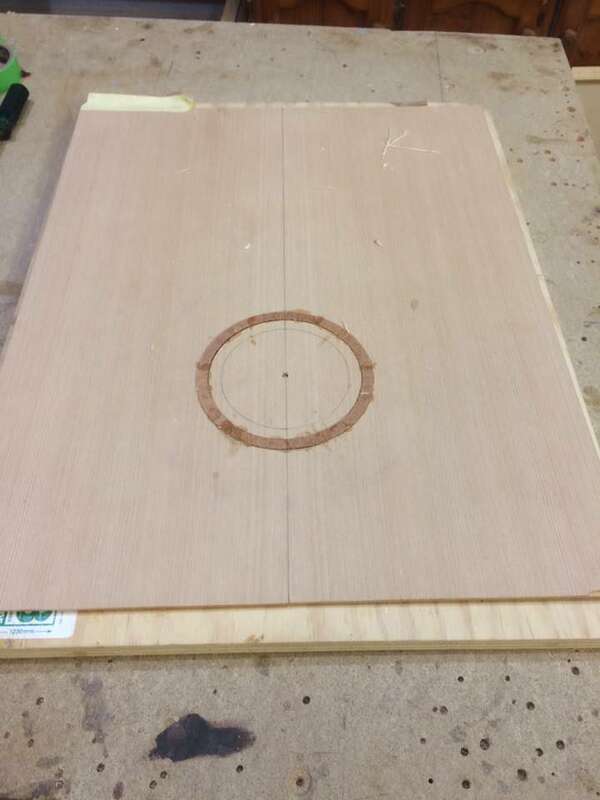 Pete has started work on the soundboard and rosettes. My guitar will be quite zen. Placing the first ring of the rosette. I could eat this cedar, it's so luscious. I'm sooooooooooooo excited for you too! Wow what a story. Enjoying the process, but really looking forward to the ending!! Thanks Mari, having guitar buddies like you to share it with makes it all the sweeter. What a brilliant post and what a fabulous thing to do. Keep the updates coming. And when it's all finished please do give a final summary of all the materials / construction - as well as loads of photos. Pete sent me these photos yesterday. Close up of the simple rosette. Silky oak, Tasmanian oak and I can't remember what the fine, black line is. 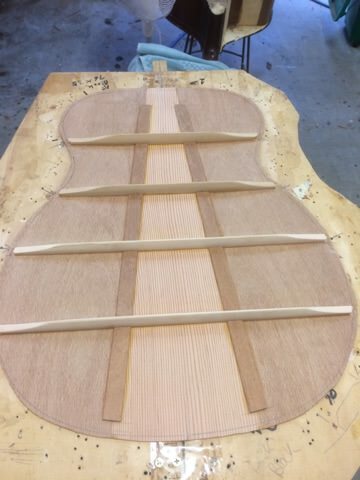 Braces go onto the underside of the soundboard. Into Pete's handmade go bar press. 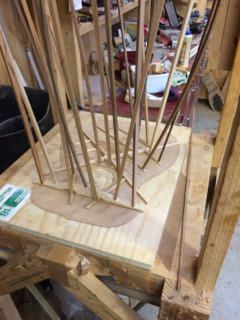 This applies pressure to the bracing till the glue dries. Bracing all glued, then into this devise which I keep forgetting to ask its name. 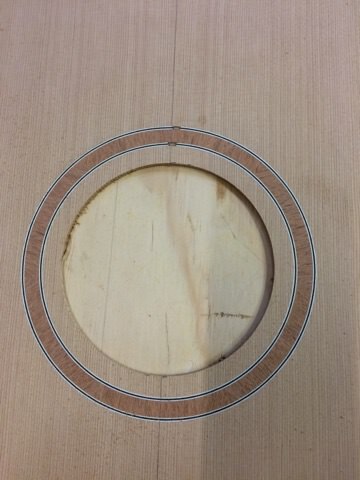 You can see the hand cut kerfelling. So am I - for you! Any scheduled delivery date yet? It will take as long as it takes! Pete is meticulous and takes his time. High humidity also slows down some of the glueing and certainly the spraying part of it. I reckon by mid April perhaps earlier, I should have her here. 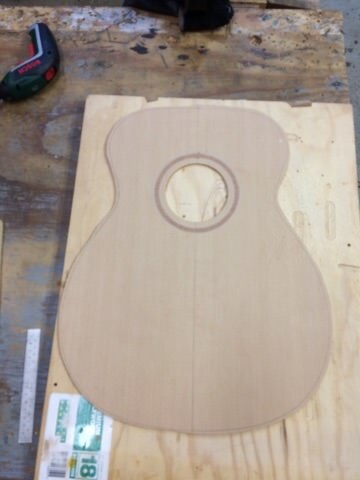 That is going to be stunning, I really like inlay so simply and classy and the back looks amazing!